Columnist, Trainer, Actor, Christian, Conservative. Recovering Politician. Hover over the small images below, to see current and recent columns. Imagine a tour group, composed of children or teenagers – visiting a big tourist town like New York or Los Angeles – hanging out politely in front of a well-known local tourist attraction like the Statue of Liberty or Times Square, waiting for their tour guide to take them to the next stop. They’ve enjoyed their trip so far – it’s been an exciting, though too-short visit (aren’t they always?) – and now they’re ready for the last leg of the trip home. They’re in a good mood as they wait where they were told to wait, patiently and peacefully, until their bus arrives. Now imagine not one, but two other groups – of adults – selecting them for abuse. For over an hour, one group shouts vulgarities at them, unprovoked. They can tell what school the kids attend, because – as is customary with tour groups – they are wearing hats or shirts that identify their school, to help keep the group together so the chaperones can take quick counts and ensure that nobody gets lost. And this group of piggish adults taunts them, hoping to provoke them into a confrontation. In an attempt to remain calm and peaceful as they wait for their bus, the kids start chanting their school cheers, hoping to drown out the taunts and forget what’s happening, as they wait, ever more anxiously, for their bus to arrive and free them from this unexpectedly miserable end to an otherwise great trip. And then it gets worse. As the kids maintain their distance throughout, staying together as they were supposed to, obeying their chaperones’ instructions to stay put as they awaited the bus, a new group of adults shows up, this time totally invading their space. One old man who appears to be their leader charges up to one of the kids, plants himself directly in the middle of the group, just inches from the kids’ nose, incessantly banging a drum in the kids’ face. Still the kids try to maintain their composure. Still they stay put, behaving, not running away, not pushing the old goon out of the way… trying to figure out at first if this new group had come to their defense against the vulgarity-spewing goons, or if they were indeed a second group of weird troublemakers, come to ruin the final moments of the kids’ day in the big city. Finally, the tour bus arrived, and the kids of Covington Catholic High School, of Covington, Kentucky, were finally freed from this nightmare. It will likely be a long time before these kids want to visit an American metropolis again. The story of the media storm that resulted from this confrontation is now well-known. The Native American activist and professional media hound Nathan Phillips circulated a brief video of his part of the confrontation among the media, edited to give the impression that these clean-cut young white kids from a Catholic high school had rudely invaded his space. By the time the full video, clearly showing the truth of the matter, had been made available, the mass media had jumped on the story, accusing the kids of bigotry and rudeness for attacking and insulting this poor old minority man. Some in the media apologized, some amazingly doubled-down, digging embarrassingly deep for straws that might somehow justify their ill-conceived decision to buy Nathan Phillips’ narrative, hook, line and sinker. For anyone raised in the bubble of the modern elite, these are automatic disqualifiers. The media will automatically take the side opposing these kids, because they’ve been conditioned to do so. Catholics must be wrong. Pro-lifers must be wrong. Young white males in MAGA hats must be wrong. The reporters saw no need to investigate before running with Nathan Phillips’ story, because it’s so obvious – in their world – that the Native American activist must be right and the white Catholic boys must be villains. What we now know is that this group of Black Hebrew Israelites is a well-known annoyance around Washington DC. They’re a tiny offshoot of a tiny cult, and they frequently harass people through their “street ministry.” Adults can disregard them and go about their business, tuning them out. What we now know is that Nathan Phillips and his band of protesters have a history of protesting for Native American rights and privileges, and using unsupported claims of discrimination to get publicity. And what we now know about the kids is that they were completely innocent, terrorized by two groups of adult goons who should have known better, transforming what should have been a proud and enjoyable trip into a nightmare of national proportions. But the media never gave them a chance. The press, the talking heads, many politicians, and even their own school, were instantly persuaded to throw these kids under the bus, accepting the minority activist’s assertions at face value. Their own school was ready to expel the kids without evidence or a chance to defend themselves. Is this truly how far our nation has sunk? The story of the Covington Catholic HS kids has been presented as a tie-in to the March for Life, a politically-connected story because they were there partially for political reasons. Yes, this group did take the bus to Washington, DC primarily to attend the March for Life that morning. But the rally – one of the largest ever, with hundreds of thousands of attendees on January 18, 2019 – was over by the time this event occurred. That afternoon, these kids were taking advantage of their time in Washington to see a couple of the tourist attractions before heading back home to the Cincinnati suburbs. They were outside their last stop on the trip – the Lincoln Memorial, by the Potomac basin – when the confrontations occurred. So the press has really made yet another error – a critical one – in viewing all this from a political perspective. The confrontations didn’t occur at the March for Life at all (we have grown to expect confrontations, sometimes, at political demonstrations). It occurred at a tourist attraction, and should be viewed as such. At any given moment in Washington, but also, at any given moment in any major city, there are lots of people hanging out at, or around, our tourist attractions. The Bean at Chicago’s Millenium Park… the observation deck at Mount Rushmore… the front steps of the Met in New York… are always busy with people, both locals and tourists, both individuals and families, and tour groups, small and large, adults and children. On nice weekends, there could be dozens of such groups at a time, trying to stay together in a safe and organized manner, to prevent the dangers of travel (pickpockets, purse-snatchers, kidnappings, and simply getting split up and lost). The tourist industry is one of the last dependable contributors to the economies of our dying cities. As America exported manufacturing abroad over the past fifty years, and as taxation and crime drove city residents to the suburbs and small towns, our cities have become ever more dependent upon the jobs and revenue contributed by hotels, restaurants, and the tourist attractions that draw them. 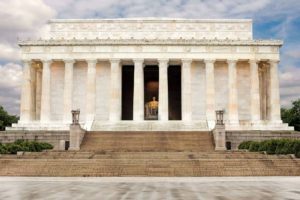 That this event occurred at the Lincoln Memorial should strike fear into the heart of every urban leader in America, because it’s now among the most famous examples of a growing problem in America: that our tourist attractions are no longer as attractive to tourists as they once were. Cities depend on these groups coming from across the country, and even across the world, to visit them. We have shopping at home; we have restaurants at home. But there’s only one Lincoln Memorial, only one Smithsonian, only one Washington Monument. If these places have become unsafe for tourists, these cities can kiss their tourist revenue goodbye. We have a policy of free speech in the United States. Our Bill of Rights sets forth a clear rule that free political speech is protected… but all rights have their limits. As the old saying goes, “my right to swing my fist ends before the bridge of your nose.” We can write, we can speak, we can record any political diatribe we want, but we can’t force anyone to publish it, and we can’t force anyone to listen to it. We have a First Amendment right to publicly assemble, but we can’t take over a public place without a very clearly-limiting, official city permit. The March for Life had such a permit, earlier in the day, at the Washington Mall. The Black Hebrew Israelites and Nathan Phillip’s noisy drum group had no such permits at the Lincoln Memorial. We have long tolerated such groups, allowing them to harangue passers-by from street corners or public parks, in the broad spirit of the First Amendment. But there must be a limit to such tolerance. If these protesters harass kids without physically assaulting them, here isn’t much that the authorities can do. We hope the kids and their chaperones will be able to bear up without allowing themselves to be provoked … and the kids of Covington Catholic High School behaved admirably. But the incident teaches a lesson to all potential tourists, all school groups, all those who are considering organizing such trips. As American society has fallen, are such trips worth the risk, nowadays? Especially when children are involved? Do we dare take our kids to the big city, with all that trouble and expense, hopefully for the trip of a lifetime – if there’s a genuine risk they’ll be harassed by the locals, or by other tourists, even at as well-known and presumably safe a place as the Lincoln Memorial? Our laws are not designed for a nation in which goons seek out innocent children for harassment, carefully standing just within the bounds so that the law can do nothing to stop them. Our laws assume decent and honorable public behavior. There is really no legal protection for tourists, if people encounter actions like those of the reprehensible Nathan Phillips and that crew of Black Hebrew Nationalists. This is a cultural issue, not a legal one. Today’s zeitgeist has told people – both in the private sector and in the press – that it’s open season on white males, and on Christians, and on people wearing MAGA hats, and on people who don’t go to the public schools, and even, amazingly, on people who support the pro-life movement. No permit required, no training and no permission. We are told that we can insult, defame, even ruin the very lives of such holders of minority opinion, without need of the usual rules of evidence, utterly disregarding the standard rules of decorum in a civilized society. We cannot look to the law to solve these problems. Until our culture returns to the traditional values of our Founding Fathers, the miserable experience of those innocent kids from Covington is sure to become ever more common. John F Di Leo is a Chicagoland-based Customs broker and trade compliance trainer and consultant. His columns are regularly found in Illinois Review.